right mouse click on "download" > „safe link as "
Don’t have the Acrobat Reader? Lucie Lomová : Born 1964 in Prague, she studied dramaturgy at Theatre faculty of Academy of Performing Arts in Prague, worked one year as a dramaturg, then she returned to Prague and after a short period of being journalist she occupies herself mostly by drawing and writing. For ten years she wrote and drew comics series for children about two small mice Anca and Pepik in a well–known magazine Ctyrlistek (1990 – 2000), which were later collected in three books. which was later published also in Czech and Polish version. 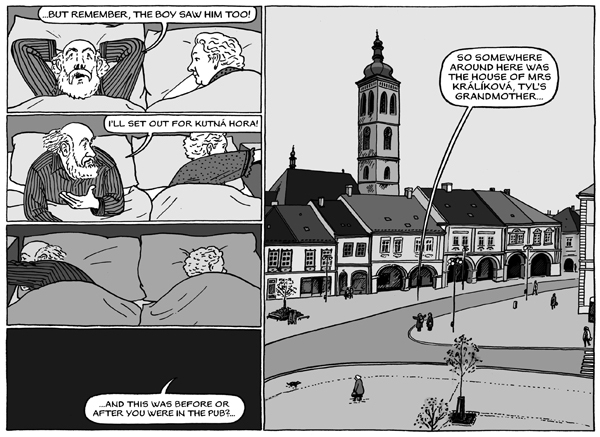 Now Lucie Lomova mainly writes and draws comics for adults. Her last published book is The Savages (Les Sauvages, 2011, Éditions de l´An 2/Actes sud), a story based on real historical facts about an Indian from South America, who was brought to Europe at the beginning of the 20-th century. 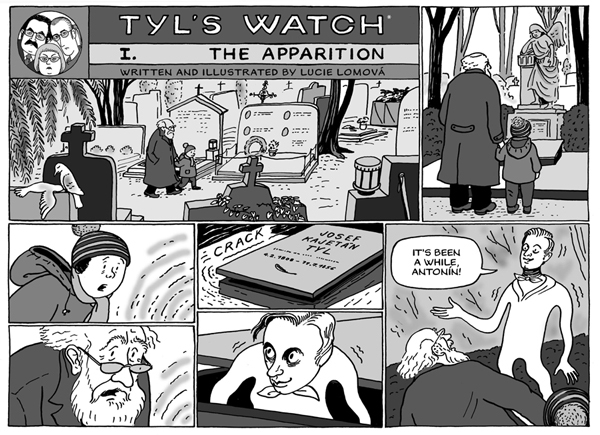 Tyl's watch was first published in Czech theatre magazine Svet a divadlo, then in Stripburger and in Black No. 10 (Coconino press). This e-book was provided by its author for free download, to read on the screen.